Fighting a long, bitter war against the Burning Legion, these draenei soldiers were infused with the Holy Light to become living weapons. Victorious at last, these Lightforged stand ready to defend Azeroth. 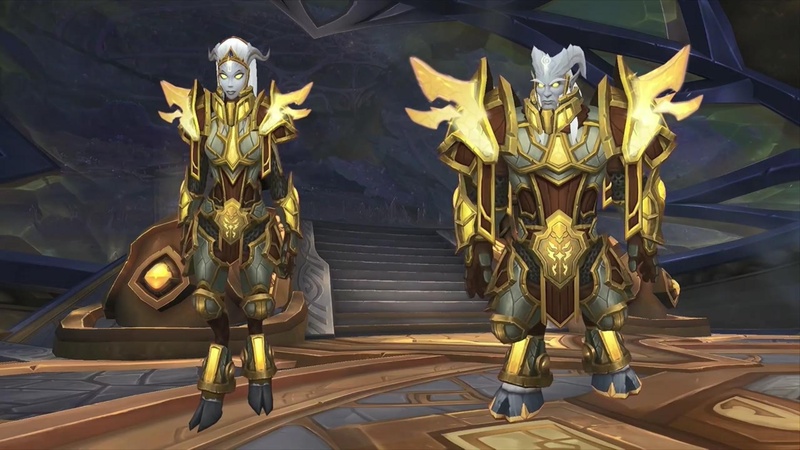 One of the new Allied Races coming in the Battle for Azeroth expansion, Lightforged Draenei were introduced as NPCs in Argus in the Legion expansion. With Allied Races, these Draenei will now be a playable race for characters on accounts that have unlocked the Race via the necessary quest chains (and reputation requirement). Note, Allied Races start at level 20, and with the new level scaling from 7.3.5, Lightforged Draenei can quest in any zone requiring a 10-60 level range, as long as said zone has Alliance quests. You must have an existing character of at least level 110 on the realm to create an Allied Race character. I have fought beside these draenei in the Twisting Nether for a thousand years. You will find no soldiers who are more skilled, or more loyal. My fellow soldiers, the trials you have endured are proof that the Light shines bright within your hearts. Racials: Lightforged Draenei are Light- and Blacksmithing- oriented. Light's Judgment Light's Judgment - Call down a strike of Holy energy, dealing Holy damage to enemies within 5 yards after 3 sec. 40 yd. 2.5 min CD. Instant. Forge of Light Forge of Light - Summon a Forge of Light, enabling Blacksmithing. Blacksmithing skill increased by 10. Demonbane Demonbane - Experience gained from killing Demons increased by 20%. Light's Reckoning Light's Reckoning (renamed from Final Verdict) - When you die the Light avenges you, dealing Holy damage to enemies within 8 yards and healing allies. Holy Resistance Holy Resistance - Reduces Holy damage taken by 1%. You can view the Female model and the Male model in the modelviewer here on wowhead. Variety of horn styles that differ from other playable Draenei. Hair color choices in variety of white shades, and blonde. Wary of magics, not only Fel magic, but all magics. Please note, you will not receive Heritage Armor for your allied race by using a character boost, race change, faction change or levels granted by recruit a friend. Has it gotten brighter in here? Because you just turned me on. Have you ever seen the bunks on the Vindicaar? I can arrange a private tour. I'm a draenei on the streets... but an eredar in the sheets. I thought my tattoo said "Light's Defender" in naaru. I found out it actually says "glowing goat". This world of yours is very strange. Talking bears who practice kung fu? On Argus, we call that a circus. After being aboard a ship for so long, it is nice to walk on solid ground again. All those hard surfaces were murder on my hooves! My life for Aiur... <cough> Argus. My life for ARGUS! Sorry if my tattoos look a little dim. I forgot to charge my battery last night. Face tentacles? We do NOT have face tentacles! If we did, that would mean draenei are secretly emissaries of the Void, gaining your trust as we infiltrate your society so that we can bring about its end. And I'm certain you're not implying THAT... are you? The Vindicaar is a fast ship. You could say it travels at Light speed. When in doubt... touch anything that glows. You must be descended from the naaru... 'cause you've got a heavenly body. Let's go back to my ship and twist our nethers. My turn-ons include my eyes, my tattoos, my armor... I mean, what doesn't turn on? I may be forged in the Light, but I know how to have fun in the dark. No, I do not have a glowing stamp above my tail. Have you met my dog? His name is Barkenon Puppos. Toes are overrated. Hooves make pedicures go sooooo much faster. I don't recommend walking barehoof on the Vindicaar. We keep finding tiny shards of crystal that didn't get swept up. We haven't crashed the Vindicaar yet... but given our track record, it's only a matter of time. One downside of being Lightforged is that my S.E.L.F.I.E.S. are always overexposed. Turalyon was the only human I saw for a thousand years. I assumed all of them were grizzled and scarred. Want some other golden/holy/light themed mounts for your Lightforged Draenei? Glorious Felcrusher - chance to drop from Gleaming Footlocker, paragon supply box for Army of the Light. Blessed Felcrusher - chance to drop from Gleaming Footlocker, paragon supply box for Army of the Light. Avenging Felcrusher - chance to drop from Gleaming Footlocker, paragon supply box for Army of the Light. Celestial Steed - $ Shop Mount. Maybe you're looking for a Holy/Light-themed battle-pet? These new races don’t appear on the standard “Create New Character” screen. You have to click on “Allied Races” in the lower left hand corner of the create a new character screen. Do their Paladins share the Exarch's Elekks with the regular Draenei Paladins? Can I change race of my human to Lightforged Draenei? What should I do first? Lightforged Draenei intro (narrated by Captain Fareeya): We are soldiers. Through millennia of struggle, the Light has shown us the true path. And in turn, we have been reborn as instruments of its power. You are Lightforged. You must stand as a beacon of hope against the darkness. But to those who would threaten this world... or attack our allies... you will embody the Light's wrath. If you walks as Lightforged to Stormwind cathedral, you get some unique interactions. Priests there with mark your connection to the Light. How come nobody mentioned the achievement to give you the Lightforged weapons? You unlock all the appearances account-wide regardless of class.